What can you do to make a piece of jewelry even more personal? If it’s a locket, then the obvious choice is a photograph. If it’s a necklace or a bracelet, you might by another piece of jewelry to put on the chain. If it’s a ring, however, then engraving is the perfect solution. Why Engrave a Tungsten Ring? You’re planning on buying a strong, durable tungsten ring, that is stunning in its own right. So why would you want to engrave it? Whether the ring is a birthday gift, a wedding band, or is a personal accessory purchase, you can engrave it with all manner of messages. What could you choose? 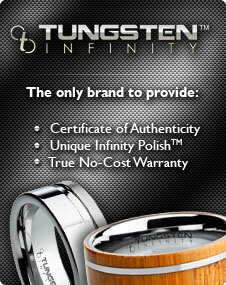 The list could go on and on, but the point is that if you want to engrave your tungsten ring, the option is there. So, how do you do it? Don’t buy a tungsten ring and then take it to your local jewelers to be engraved. Tungsten rings should not be engraved by etching them in the traditional manner; it is best to have them professionally engraved by the company you buy the ring from. In addition, you need to ensure that your ring will be laser engraved. Laser etching is used for tungsten rings as it means there is no contact with the ring and leaves a slick, professional finish on the metal. In contrast, traditional etching looks unsightly, and can even weaken the tungsten ring. Why would you want to do that having invested a sum of money into a durable, high quality product? With traditional etching, you are also stuck with a certain number of styles you can use. Laser etching allows for more fonts, styles, and even patterns. You can even have a quality laser engraving around the outside of your tungsten ring, should you choose to do so. Laser etching for your tungsten ring can make the most personal of gifts or purchases even more so. Don’t ruin your product because of something such as etching. Laser etching is simple and affordable, and is the only way to ensure quality engraving for your tungsten ring.